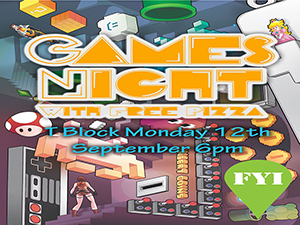 This event, proudly hosted by I.T. 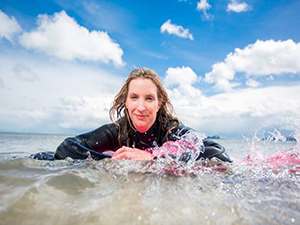 Tralee, will take place from 19th to 21st October in partnership with the Adventure Tourism Research Association (ATRA). 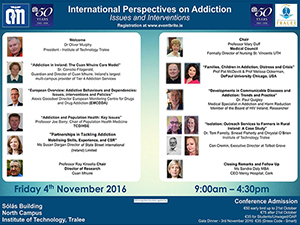 On Friday 4th November 2016, the Institute of Technology, Tralee in association with Cuan Mhuire, will host an important conference on the theme of addiction. 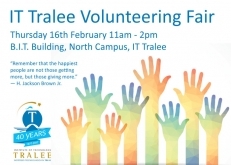 IT Tralee Careers Services invite you to a Careers Fair to come and meet local, national and international companies in person to explore opportunities for your future career. 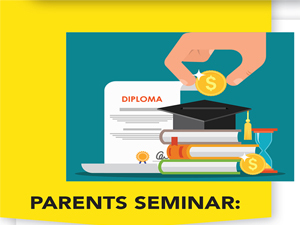 A not to be missed event for parents with Leaving Certificate students. 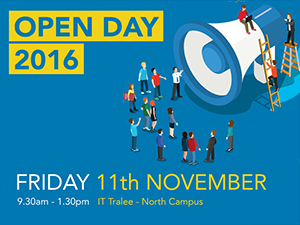 #ittopenday is structured to help you to get the most from your visit to IT, Tralee. This page contains a full schedule of talks, tours and events. Thinking of going to college this September? Not sure how to apply to CAO? Room L108 Sólás (Nursing) Building and Business & IT Building at the North Campus. Need Help Filling Out Your CAO Online Application? Business & IT Building at the North Campus. Are you a 2nd or 3rd year on a level 6 or level 7 course? 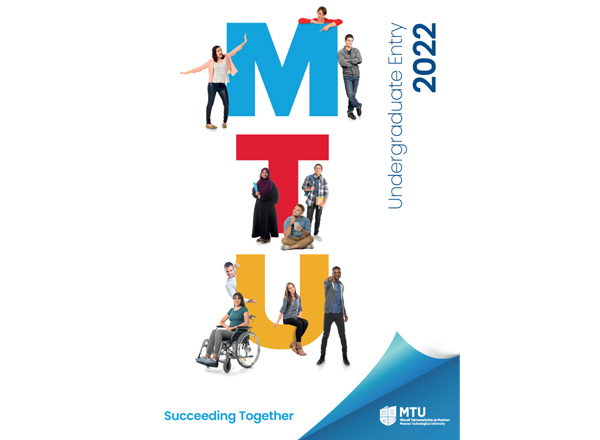 This event will provide information on preparing for higher education, application routes and processes and the support services available to students with disabilities and learning difference. In 2015, the National Forum for the Enhancement of Teaching and Learning in Higher Education published the report ¿Teaching and Learning in Higher Education: A Roadmap for Enhancement in a Digital World 2015-2017'. 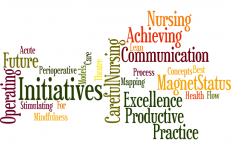 We are delighted to be hosting a Professional Practice Networking and Engagement Day at the Institute of Technology Tralee on the 7th April 2017. On the day there are a number of events that will be of interest to you from 9.30 to 2pm. 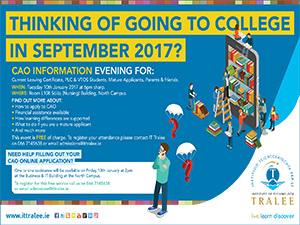 An information evening will be held on Tuesday 25th April, 2017 from 6.00-7.00pm at the Sólás Building, IT, Tralee, North Campus. 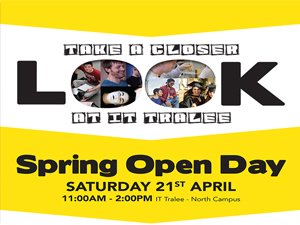 Come and meet our staff for an in-depth look at courses at IT Tralee. Talks are repeated throughout the day. To support our research activity the Institute is pleased to announce details of its 2017 Master by Research Scholarship Programme due to commence in September 2017. New Frontiers - Free 1 Day Business Bootcamp - Register Now! 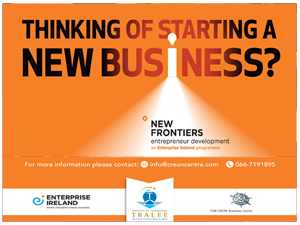 New Frontiers Programme - Thinking of starting a new business? - Apply Now! 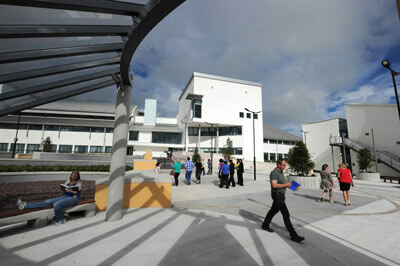 Tom Crean Business Centre at IT,Tralee and the Rubicon Centre at CIT. Join us on Sept 1st 2-4pm in the Tourism Building, North Campus, IT Tralee for our Information and Recruitment Day. Direct Entry Application. Careers Fair 2017 - Online Exhibitors Booking Form open until 5pm 6th October 2017. 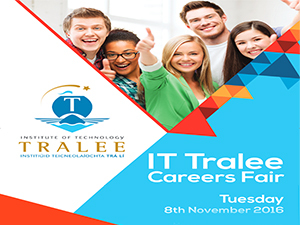 On behalf of the Institute of Technology Tralee, I would like to cordially invite you to participate in our annual Careers Fair taking place on Wednesday, 18th October 2017. 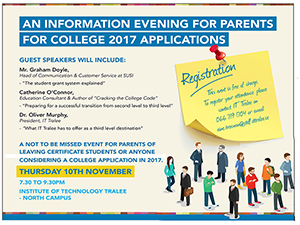 A not to be missed event for parents of leaving certificate students or anyone considering a college application in 2018. 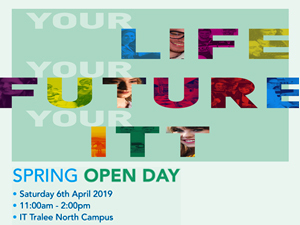 Open Day gives you the perfect opportunity to speak to lecturers and find out more about the courses available at IT, Tralee. Congratulations on reaching your Graduation! This provides you with important information for the day. Meet the many STEM companies based in Kerry and find out more about the STEM jobs market. 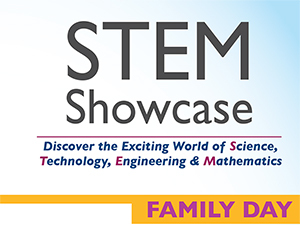 A variety of interactive workshops to engage and intrigue both children and adults alike and bring to life the world of STEM. "Win a 100 euro to spend at your favourite shops and an iPad, take our careers survey!" Everyone at the Careers Service needs your feedback to continue to give you excellent careers support. 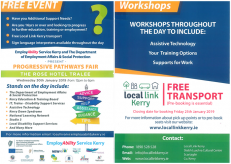 The Institute of Technology Tralee, CYPSC, NEWKD, SKDP, EmployAbility Service Kerry, National Learning Network and the Department of Employment Affairs and Social Protection..
Manor West Hotel, Manor West, Tralee, Co.Kerry. The President of the Institute of Technology Tralee (ITT), Dr. Oliver Murphy and Sr. Consilio, founder of Cuan Mhuire extend to you a warm invitation to the 2018 Forum on Addiction. KERRY MONTH OF ENTERPRISE AT IT, TRALEE - DiscoverITT Enterprise Academy. The academy provides opportunities for current students and alumni of the Institute to listen, learn, share & potentially set up their own business. 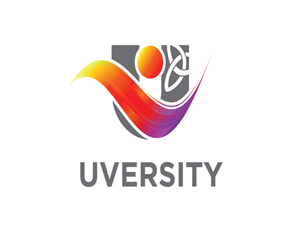 The scholarships reward excellence and encourage outstanding performance in sport and are open to applicants for all programmes at IT Tralee. 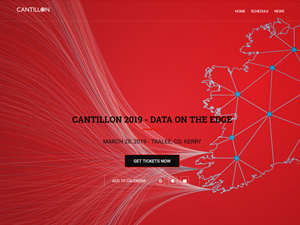 IT Tralee Cantillon 2018 in association with FEXCO, Ireland's only one-day, fintech forum. Cantillon 2018 Conference will focus on the new borders that will be created after BREXIT and how industry must find solutions to bridge them. Through a series of facilitated workshops, the purpose of this day is to help you to refine your value proposition and articulate your business offering. Tech Tuesday is an informal network gathering which shares, discusses and debates new and developing insights on technology related topics. 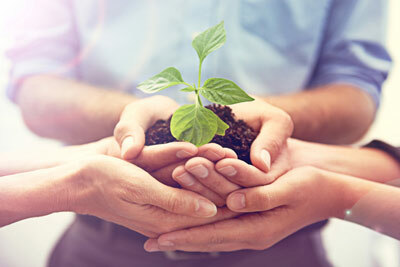 Oportunity for companies in the New Frontiers Programme to pitch their business to a panel of investors for potential funding and/or mentorship. The Tralee Junior Chamber Alliance presents a challenge to rejuvenate a key building located in the town of Tralee. 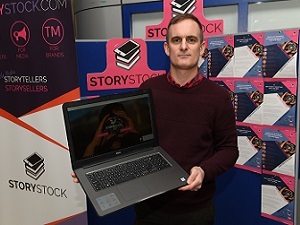 IT Tralee Enterprise Showcase - Kerry Innovation Challenge. The 2Day2K challenge will begin on Monday March 26th at 1pm and conclude at 1pm on Wednesday March 28th at 1pm. iEER Action Plan Local Launch (will take place at the IDA/EI breakfast) iEER is an Interreg Europe funded flagship project bringing together 10 regions around Europe. 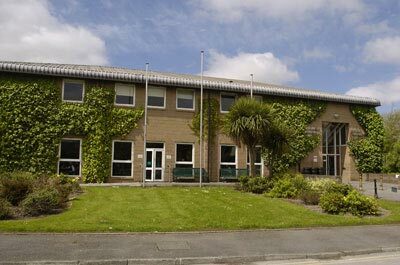 An information evening will be held on Tuesday May 1st, 2018 from 6.00-7.00pm at the Sólás Building, IT Tralee, North Campus. 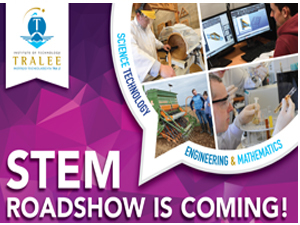 IT Tralee¿s Science Technology Engineering & Mathematics Roadshow will travel to Caherciveen to provide students with information on the wide range of education and career possibilities available to them. 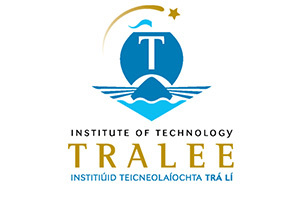 IT Tralee¿s Science Technology Engineering & Mathematics Roadshow will travel to Killarney to provide students with information on the wide range of education and career possibilities available to them. The closing date for submission of applications is 6th June 2018. Shortlisted applicants will be required to attend for interview during week commencing 11th June 2018. 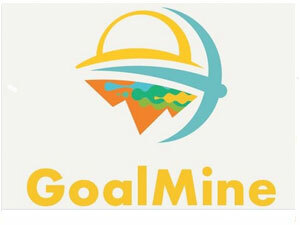 GoalMine aims to create an experiential fun learning environment allowing all participants between the ages of 13 years and 16 years of age to explore their individual entrepreneurial, creative and innovative mind-set. Exciting range of courses to choose from! ITT holds a Mathematics examination for applicants who have expressed an interest in any of its programmes that require certain minimum levels of performance in Mathematics. 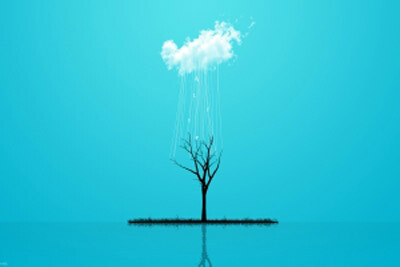 Lifelong learning programmes. Closing date fast approaching. We hope you find this information helpful in making your Graduation Day an enjoyable and memorable occasion for you and for your guests. #ittopenday is structured to help you to get the most from your visit to IT, Tralee. This event will provide information on preparing for higher education, application processes and the support services available. Springboard Courses January 2019 - Dates For Your Diary - Application, Registration, Commencement. Applications now open, Deadline for receipt of completed application 11th February. Third Year Students from the Health & Leisure Outdoor programme are undertaking a 10 day expedition to Finland. 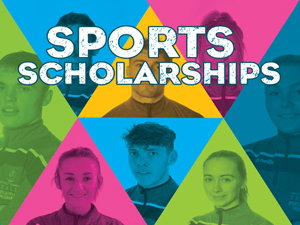 The scholarships reward excellence and encourage outstanding performance in sport and are open to applicants for all programmes at IT Tralee. Successful recipients may be eligible to receive a place on reduced points in their chosen course. This event provides an ideal opportunity for students, staff, visitors and potential start-ups to talk to those who have already taken the plunge to set up their own business in Kerry. 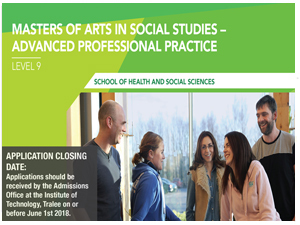 External Applicants - Direct Application Add-On Courses - Apply on or before 4.00pm on Friday 29th March. Staff and students will be available all day to answer your questions. Ask them about programmes, facilities or campus life. Post-Registration Programmes:Apply by 15th May, 2019. 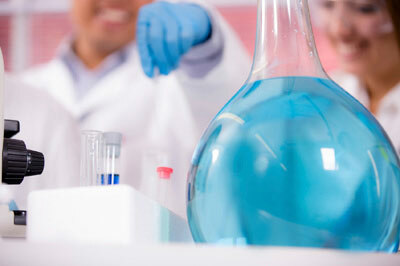 Dr. Helena McMahon, Department of Biological and Pharmaceutical Sciences, Institute of Technology, Tralee, Kerry, Ireland. Solas Building, Institute of Technology, Tralee, North Campus, Dromtacker, Tralee, Co. Kerry, Ireland. V92HD4V.